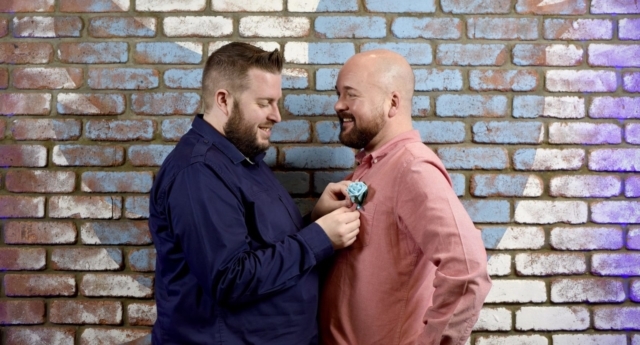 A gay couple who met on Twitter six years ago are going to be exchanging their I dos at the social media headquarters next month. Simon Savidge (@SavidgeReads) and Chris Burton (@ohchrisburton) met on Twitter after speaking about their mutual love of cheese and beards on the micro-blogging site. “I work in cheese and have a beard, so two out of three isn’t bad,” Chris tweeted to Simon when he saw that he loved books, cheese and beards. After spending a week exchanging DMs (direct messages, in layman’s terms) the pair agreed to a hot date sorting out Simon’s shelves – and the rest is history. “Some family and friends have thought it was slightly unusual to find love through social media. Or very modern. However Twitter was, and still is a really interesting platform to meet like-minded individuals,” said Simon. “I loved that I could see from Chris’s Tweets that we had some similar passions but most importantly get a gist of his personality. He was hilarious over DM and I thought life is too short to not to see where it could lead,” he added. Chris popped the question in Cyprus in 2017, and will be exchanging 280-character Twitter vows with his partner in their headquarters next month. “Six years later, we’re getting married,” said Simon. “Meeting on Twitter is really important part to our story, as without it we probably wouldn’t have met, so it’s great if slightly surreal that we can exchange 280 character vows at the actual Twitter HQ,” he added. The couple are set to officiate the ceremony on March 3rd at St George’s Hall in Liverpool.